San Diego, Calif. – June 14, 2018 – According to the American Dental Association Policy Institute, approximately 67 percent of low-income seniors did not visit a dentist in the last year. The reasons for not seeing a dentist vary, and range from high cost, lack of transportation, fear, not feeling pain or even believing that it is no longer necessary to visit the dentist as we age. One thing is for certain, if you do not address oral health, poor prevention or lack of treatment can lead to serious health issues not only in your mouth but elsewhere in the body. But the good news is, it is never too late to start taking care of oneself with an oral hygiene routine and some basic prevention. 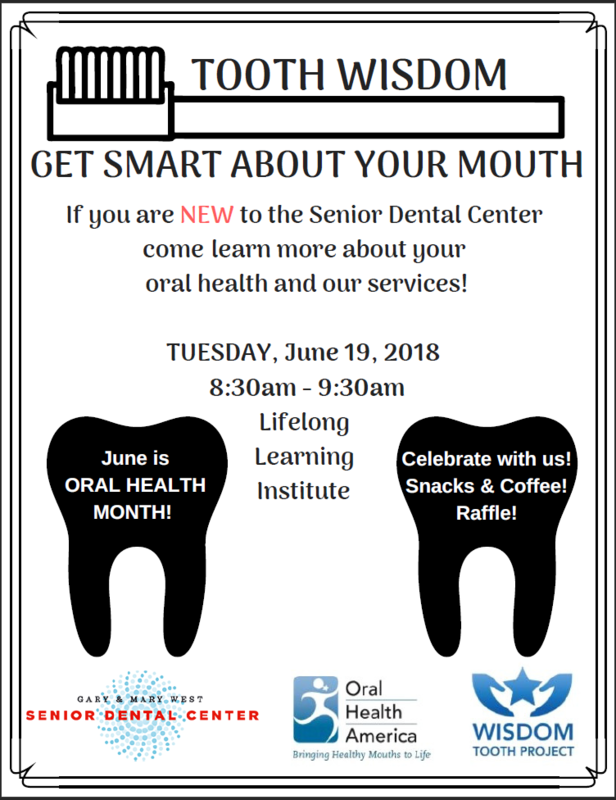 To address this need, the Gary and Mary West Senior Dental Center, a nonprofit community dental center dedicated to serving low-income seniors 60 and older in San Diego County, will host “Tooth Wisdom: Get Smart About Your Mouth,” a free dental health workshop developed by Oral Health America. Seniors are invited to attend on Tuesday, June 19 from 8:30 a.m. to 9:30 a.m. The workshop will be held at Serving Seniors’ Gary and Mary West Senior Wellness Center, located at 1525 4th Avenue, San Diego, CA 92101, and is free and open to the public. Space is limited so please RSVP by email to info@seniordentalcenter.org. The “Tooth Wisdom” workshop is presented at the Senior Dental Center by a registered dental hygienist. The Senior Dental Center’s mission is to provide affordable, high-quality oral healthcare with comprehensive education, clinical, and wellness services for seniors in need, enabling them to live healthy and productive lives. The workshop information is presented in partnership with Oral Health America, a national non-profit dedicated to increasing access and oral health literacy.